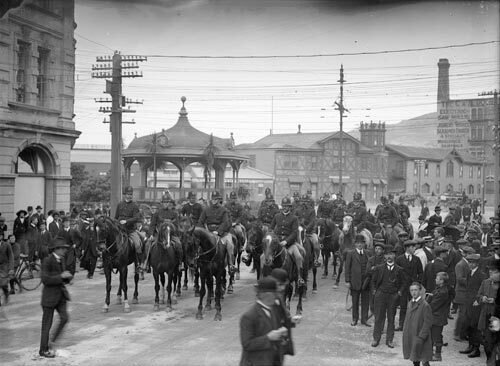 Uniformed mounted police block a street leading to Wellington’s waterfront during the nationwide wave of strikes in late 1913. These police had to deal with running street fights by large groups of strikers, and were publicly criticised for not acting with enough force. As well as regular police, several hundred ‘special constables’ (volunteer temporary police) were recruited, many from farming districts, to assisting in restoring order during the strikes. However, their provocative actions sometimes created further discord, rather to suppress it.